It is fall in my neck of the woods and I am so very happy about it! I’m trying to enjoy it as much as possible. That means a walk in the woods at the Blandford Nature Center today. 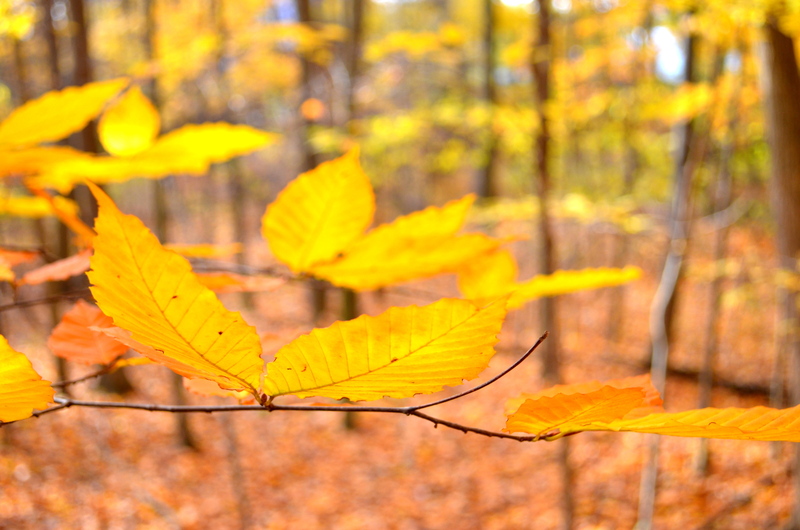 Being outside in the woods with sunshine filtering through the orange and yellow leaves was so good for my soul. Enjoying fall also means taking food photos outside. Why haven’t I been doing this all year? 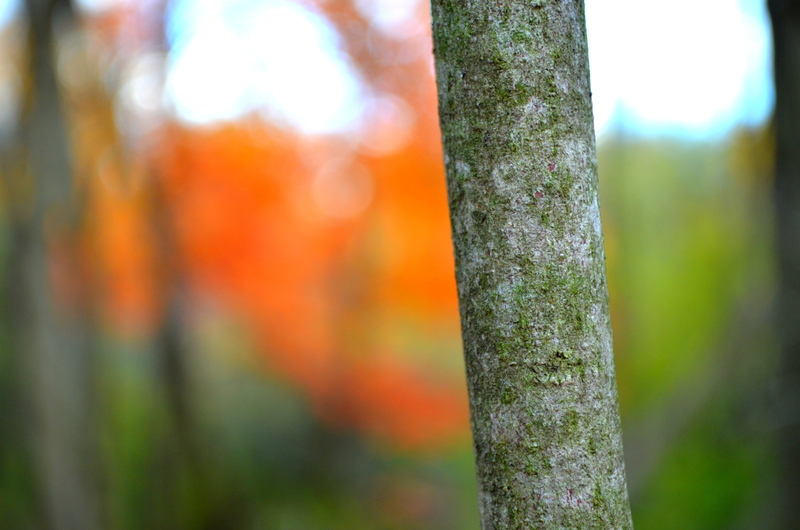 I’m envisioning a truly seasonally focused blog right now…with backgrounds that show the seasons. Hot cocoa in a snow bank? Yes, please! Finally, enjoying fall to its fullest also means making foods that are in-season…things I didn’t crave in the summer but can’t wait to get my hands on now. Once the chill hits the air, I become obsessed with winter squashes and can’t get enough of them. I hope you all enjoyed my butternut squash tacos that I posted last week. They were a big hit in this household and were even featured on Kalamazoo’s Channel 3 this week (click here to see)! 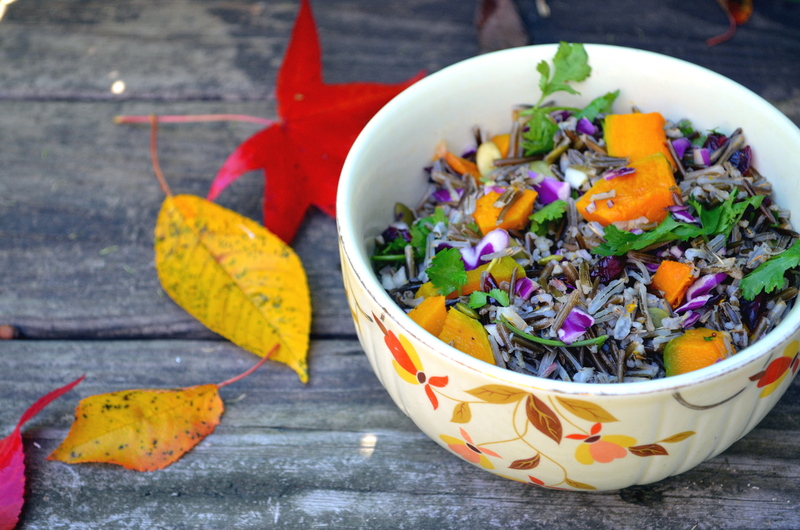 This week, in addition to craving winter squash, I was craving wild rice so whipped up a recipe that married these two favorite foods of mine–a wild rice and winter squash salad with cranberries, raw pumpkin seeds, cilantro, shallots, red cabbage, and a sherry vinaigrette. So easy! So fall! As it turns out, we have wild rice in the pantry that was gathered by my mom. I love when I get to eat foods grown, harvested, or prepared by those I love and what could be better than food harvested by my own dear mom? I’ve also been wanting to post a recipe with wild rice because I took photos from a hands-on experience with the harvesting process of wild rice at the Harvest Gathering Music Festival a few weeks back. 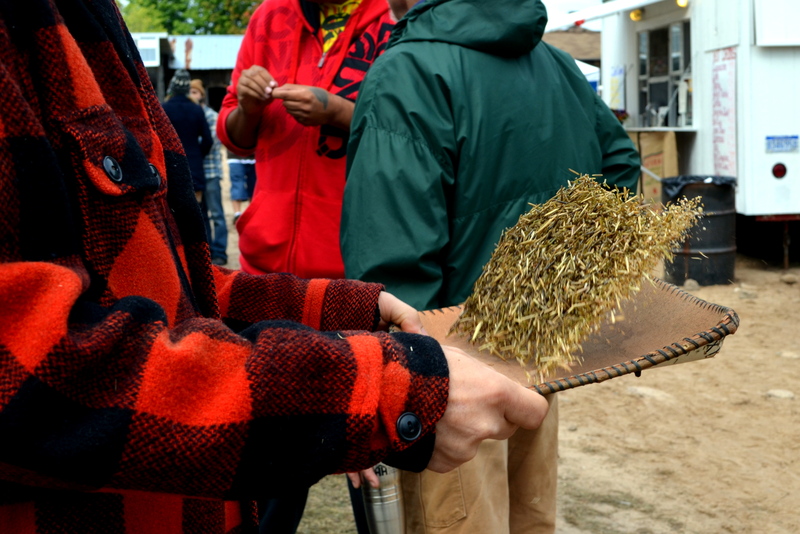 While we were walking about the festival grounds, we ran into Lee Sprague, a friend who harvests wild rice, and talked to him about the process of harvesting it. 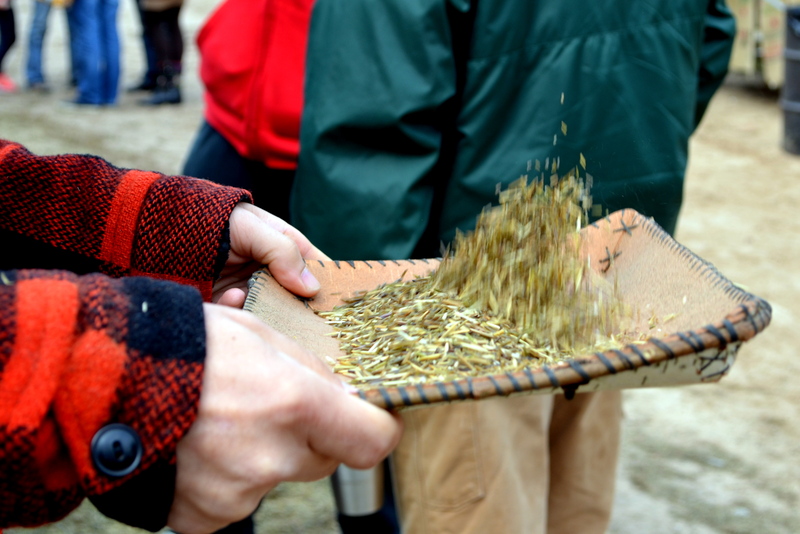 He had a team of volunteers who were keeping their hands busy with each step of the harvesting process and showed us what went into the traditional practices behind the harvesting of wild rice. It gave us great appreciation for the wild rice we have at home and the time, tradition, and love that went into harvesting it. I have several photos and descriptions so if you just want to get to the recipe…feel free to scroll down through them! 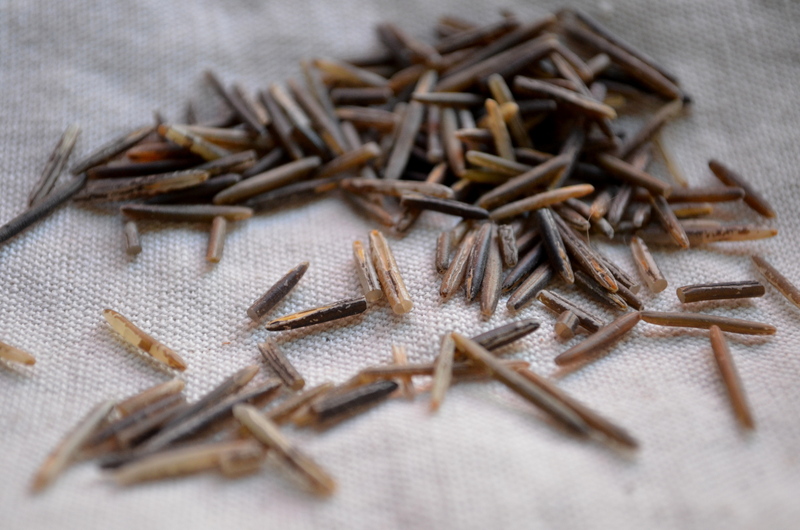 Wild rice, or manoomin, the Anishinaabemowin name for wild rice, is harvested using a canoe and ricing sticks to thresh or knock the rice into the canoe. Harvesters pull stalks of the rice plant into the canoe then knock the kernels into the bottom of the canoe. 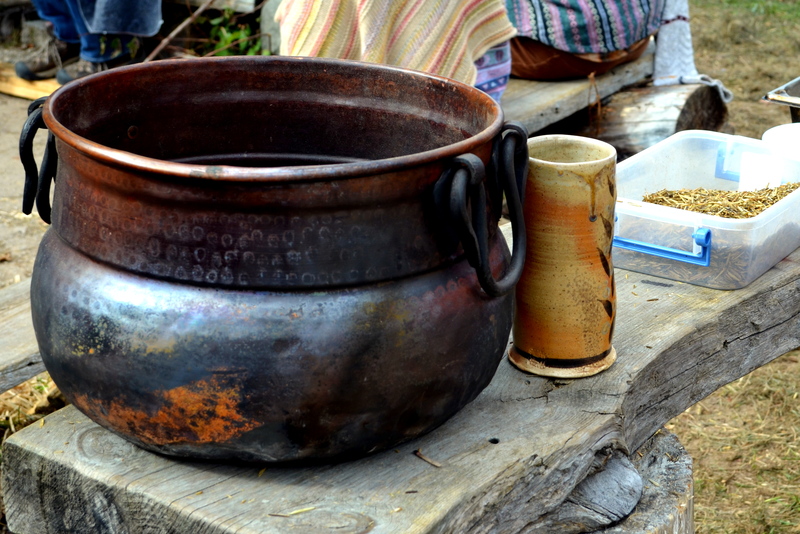 Once gathered, the manoomin must dry for a couple of days in the sun. The next step is to parch the rice to ensure that the moisture is removed from the grain. This is a heavy kettle used for parching the rice, which reduces the moisture to ensure longevity on the shelf. It also loosens the hull from the grain. Next comes the hulling process. I don’t have a photo of this part of the process, which is such a bummer because it was one of my favorite parts! A hole is dug into the ground and covered with a deerskin or tarp and harvesters “dance” the rice by stepping on it and twisting their heels left and right, being sure to also twist into each the edges of the hole. This process rips the hulls off of the grain. Once hulled, it’s time to winnow the rice using a beautiful birch bark tray. Once hulled, wild rice must be cleaned of its chaff. The wind is very useful in this process as it helps the chaff blow away. 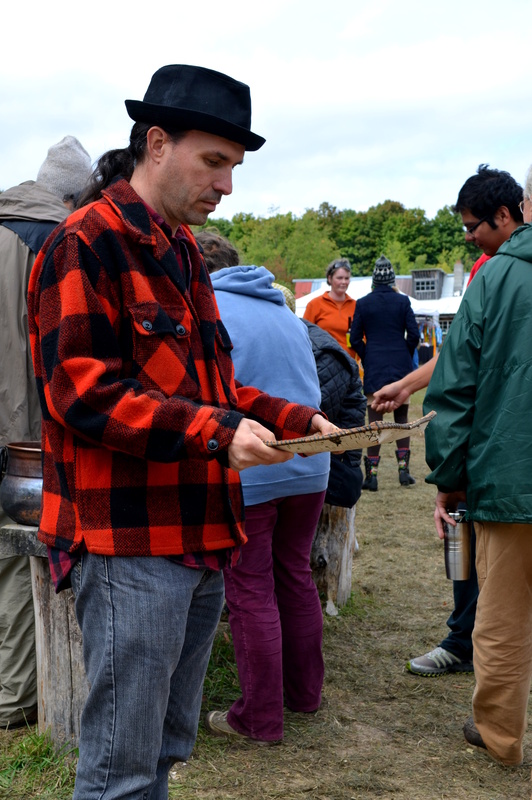 Lee showed us how to winnow using a birch bark tray called nooshkaachinaagan. Drew was really good at the winnowing process! Drew gently tossed the wild rice into the air, letting the wind help him blow away the chaff. The wild rice falls back into the birch bark tray, the broken bits fall onto the ground, and the chaff blows away. This is the manoomin partway through the winnowing process. You can still see some chaff and broken bits of wild rice. 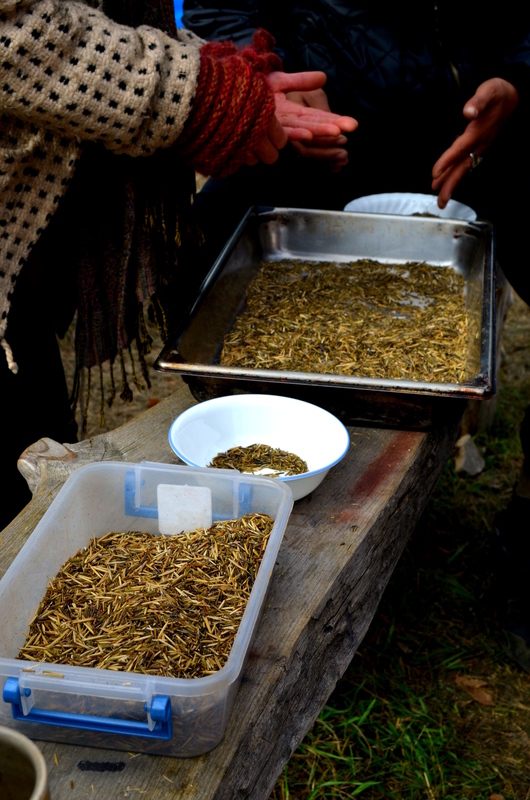 Here, volunteers finish the process by picking through the rice, removing any bits of chaff that remain after winnowing. 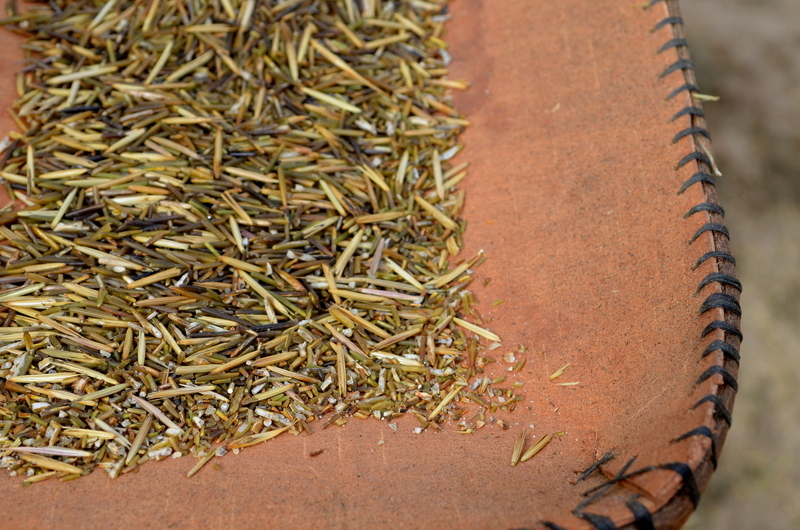 What is left is beautiful full grains of wild rice, ready to cook or store. Now…the next time you eat wild rice, you’ll know a bit about what goes into the harvesting process! 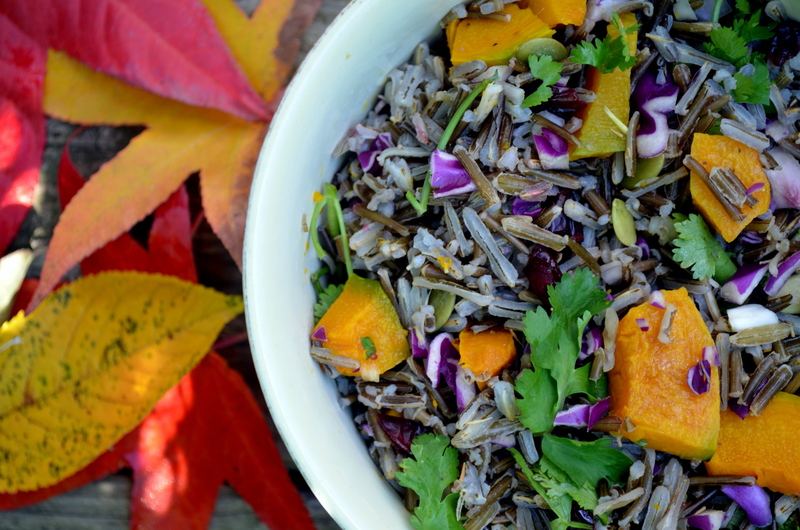 And, if you find this post appetizing and decide to make a wild rice salad, you may be eating some wild rice very soon. 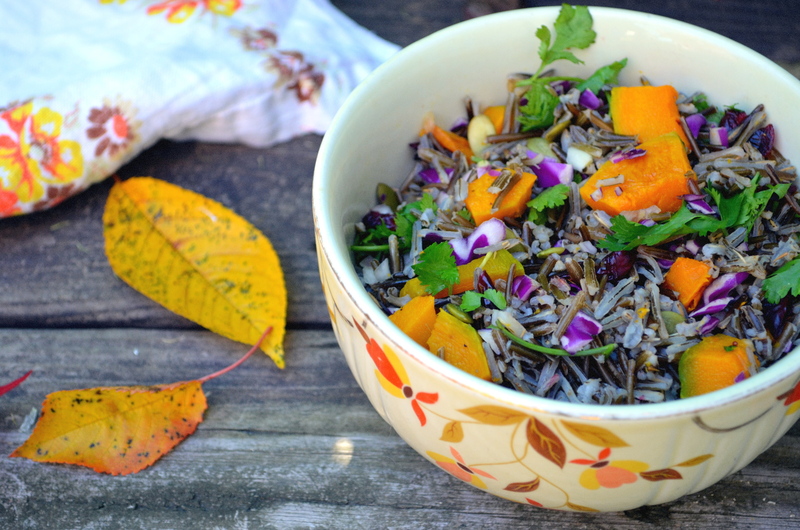 Want to try wild rice but not convinced about this salad? Try one of these other wild rice based recipes from Cooking Light: Sweet Potato and Wild Rice Salad, Wild Rice and Carrots, and Wild Rice Stuffing With Dried Cherries and Pecans (something like this is sure to end up on my Thanksgiving table!). 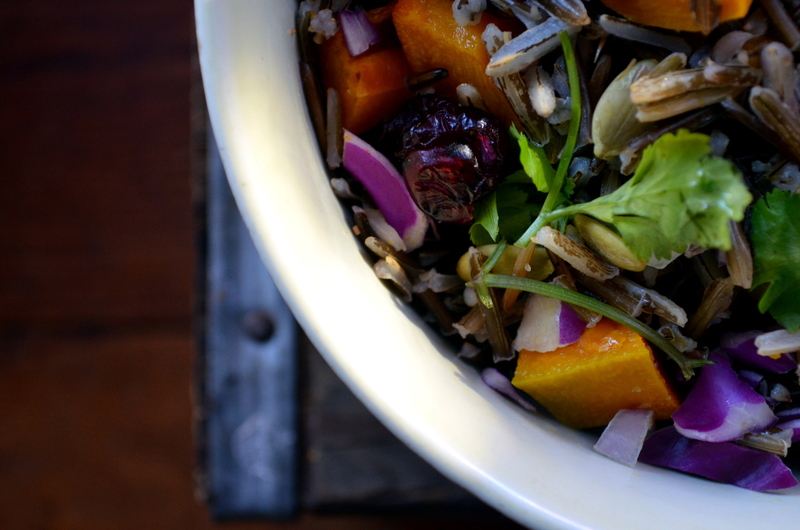 Recipe for my wild rice and winter squash salad is below! Thanks for sticking with me through this post! I had so much to share! Be sure to rinse your wild rice thoroughly then add to a saucepan with water. Bring to a boil then turn heat to simmer, place a lid on the pot, and simmer for 30-50 minutes until water has been absorbed and the rice kernels are tender. The kernels will have burst, showing the white insides of the rice. If the kernels curl, you have cooked the rice too long. It should have a slightly chewy texture when done. While rice is cooking, heat oven to 375°. Lightly oil a baking sheet and spread cubes of squash onto the sheet. Bake for about 20 minutes, until tender enough to be pierced and lightly browned. Let the rice and squash cool slightly then add to a large bowl. Stir in the cabbage, cilantro, pumpkin seeds, cranberries, minced shallot, vinegar, and oil. Season to taste with salt and pepper. This salad is great served warm, at room temperature, or cool!